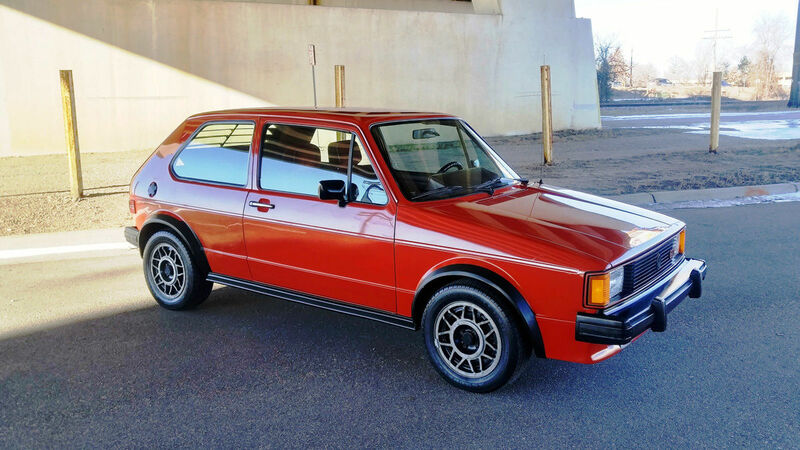 Find this 1983 Volkswagen Rabbit GTI here on eBay bidding for $6,600 in Hopkins, MN with 3 days to go. 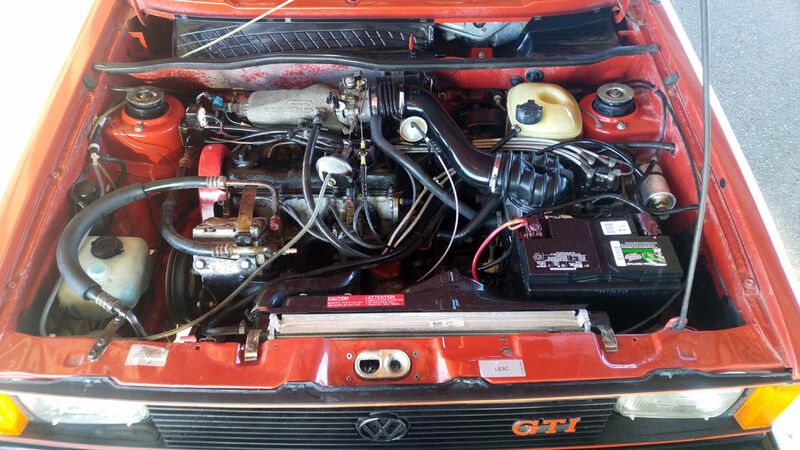 When Volkswagen launched its original GTI for the European market in 1977, the automotive world applauded. A fun car, lively in spirit, quick in a straight line and tenacious in the turns, with room for four at an affordable price--and one that didn't require you to mortgage the house to fill up the tank. The ballistic little box was a sensation: Instantly the GTI launched an entire genre of car, the hot hatch, with imitators from everyone from Fiat to Peugeot jumping on the bandwagon. American enthusiasts saw this car and waited with bated breath. And waited. And waited. For six years, they waited. American enthusiasts started to lose hope: VW opened a Rabbit plant in Westmoreland, Pennsylvania, and immediately set about "Americanizing" the Rabbit--color-keyed interiors, flattened seats, faux wood trim inside, softened suspension. 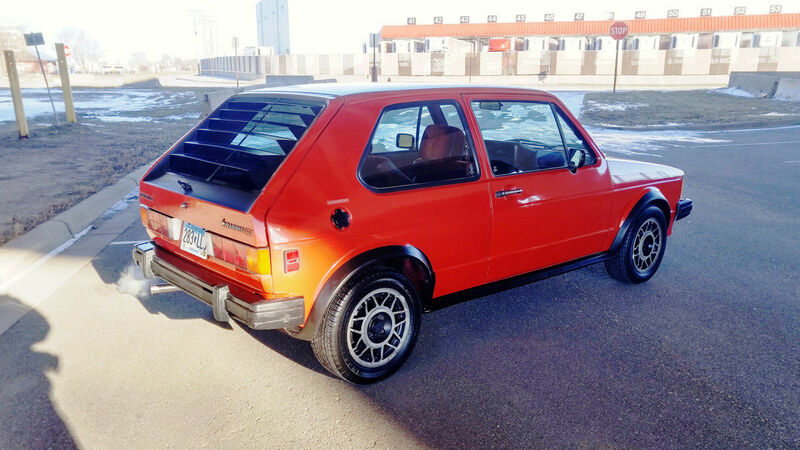 By early 1982, the American arm of VW was on the ropes: sales of Rabbits were 45 percent below 1981 sales levels, thanks in part to cheap gas making diesel versions far less attractive in the marketplace. Something had to be done. That something was the GTI, a car that recently installed VWoA head Jim Fuller demanded to spearhead the marque's turnaround, which included embracing its German heritage and building absurdly fun little cars. The GTI did both. And really, the GTI was a sensation because there was nothing else like it. Dodge Omnis and Ford Escorts and other front-drive cars were out there on the American roads, and while some of these attempted to be sporting, only the GTI pulled it off. Today, 0-60 times in the high 9s sounds sluggish, but 30 years ago, the GTI would stomp the all-new-for-'82 Pontiac Trans Am, with five whole liters of displacement and a four-speed stick, by an entire second to 60 MPH. And with a price tag of $7,990 to start, you can see the eyes of the cheap-speed brigade light up and start looking over at the local VW store. Fears that the American GTI, also built in Westmoreland, was going to turn into a Malibu the way the base Rabbit did, were wholly unfounded. Of course, the U.S. car got the larger federal bumpers as well as the new single-square-headlamp facelift that all of the 1981 U.S.-built Rabbits received across the board. All of the chromed and polished trim was blacked out, including the bumpers, and a set of 14x6 alloy wheels rested on 185/60HR14 Pirelli rubber. A subtle air dam jutted out from beneath the front bumper. 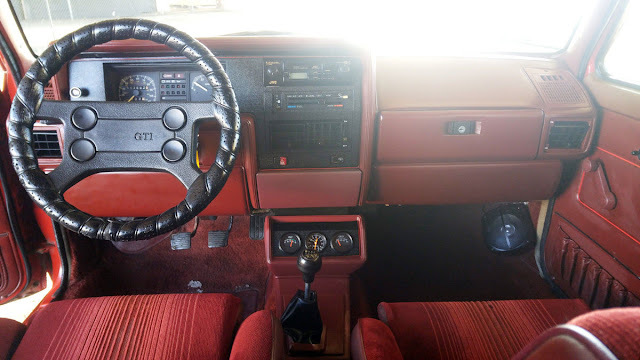 Inside, they featured heavily bolstered seats, the Scirocco's sporty four-spoke steering wheel, a set of ancillary gauges atop the console, a golf-ball shift knob (European versions were called Golf, after all), and unadorned, crinkle-finish black plastic instrument panel surfacing replacing faux-wood. A close-ratio five-speed gearbox, imported from Germany, encouraged keeping the revs up on what was then the biggest, hairiest Rabbit engine America had seen. Today, 90hp sounds like no great shakes, but it was 16 horses better than other U.S.-spec Rabbits (although it was also 16hp shy of the Euro-spec GTI). VW reached that figure by boring the block out and reaching 1,781cc (up from 1,715cc), bumping compression to 8.5:1 (up from 8.2:1), installing larger valves in the head, and stirring a low-restriction exhaust into the mix. Piston weight was reduced by 20 percent, and connecting-rod length grew by 10 percent, in an effort to smooth out the four's rougher edges. (It worked.) Top speed was 104 MPH, which was all you could ask for with a 3.89 final drive and a .91 overdrive fifth that was a thousand revs shy of the 6,700 RPM redline. We do our best to accurately describe the vehicle to the best of our abilities. Any descriptions or representations are for identification purposes only and are NOT to be construed as a warranty of any type. It is the responsibility of the BUYER to have thoroughly inspected the vehicle, and to have satisfied himself or herself as to the condition and value and to bid based upon that judgment solely. The SELLER shall and will make every reasonable effort to disclose any known defects associated with this vehicle at the buyer's request prior to the close of sale. The BUYER is responsible for any/all shipment costs involved in transportation of the vehicle. References for shippers are available upon request.